Now, you can monitor Hootsuite streams, collaborate on customer support issues, and publish social messages—right from Microsoft Teams. It all started in November. Microsoft Teams—the chat-based workspace in Office 365—was revealed to the world. At the time, Hootsuite was also announced as an early developer partner (along with Zendesk, Asana, and Intercom) to extend and customize Teams. Today, we’re excited to show you what we’ve built. You’ll see how Hootsuite and Teams makes your social media workflows way more productive. You’ve probably noticed—the future of workplace communication is open and instant. Employees (especially millennials who will be an estimated 75 percent of the global workforce by 2025) look for flexible and collaborative work environments. Teams is the virtual equivalent of the modern office; enabling work to become visible and accessible. As their introduction video explains, Teams is a chat-based workspace. It gives your employees a central place to collaborate, communicate, share files, and get things done. Hootsuite has built a “Tab” integration with Teams. If you use Teams, you can now see your Hootsuite streams, publish content, chat about incoming mentions, and respond to social messages directly within the Teams interface. Here are four workflows to inspire you. Already use Teams? Add Hootsuite as an app. 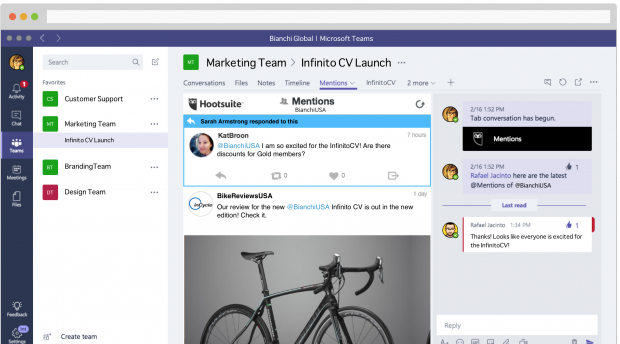 You can then see your Hootsuite streams, publish social messages, assign tasks, and collaborate on shared streams. Customers often ask difficult questions on Twitter and Facebook. With our Teams integration, customer support agents can open a chat directly beside a shared Hootsuite stream. This makes it easy to brainstorm a response with a few teammates. Or assign someone else to pick up the conversation. Let’s say you launch a new beta product. You can monitor customer responses on social channels and have real-time team discussions about the product launch. Just create a shared “Mentions” stream in Teams, share it, and chat with about new mentions. It’s also easy to assign messages, find files (such as a template of responses provided by PR), or like, reply, retweet, comment, or assign messages right inside Teams. If you’re a Microsoft Office 365 user, Teams provides quick access to Microsoft Word, Microsoft Excel, Microsoft PowerPoint, Microsoft SharePoint, Microsoft OneNote, Microsoft Planner and Microsoft Power BI. Let’s say a PR crisis starts to unfold on Twitter. Quickly jump from the Hootsuite Tab in Teams onto a video call with your PR team. Or access SharePoint to find an image or file and then publish a message via Hootsuite. “The integrations our ecosystem partners are creating for the Microsoft Teams platform, built on Office 365, will enhance the overall experience we’re delivering to users,” said Bhrighu Sareen, General Manager for Microsoft Teams at Microsoft Corp.
What’s next for Hootsuite and Microsoft Teams? Teams now has 150 partners creating an ecosystem of apps and collaboration tools that are live now or coming soon to enhance your productivity. Let us know what you think of the new integration and what we should build next. Find out how to get started with this integration.